Our bakery courses are designed for everyone, regardless of skill level or experience, to gain confidence in the kitchen. In the beautiful and natural surroundings of River Cottage HQ, our selection of courses allow you to go back to basics and to explore this simple but rewarding process in an inspirational environment. Baking is a universal constant. It’s been called a form of mental and physical therapy but it goes deeper even than that. Every country and every culture has a heritage of baking so the act of baking is the act of understanding tradition. It’s primeval: food plus fire equals pleasure - it’s that simple, but to understand it and to get it right takes time, patience and a little guidance. With that in mind, we have an expert team of chefs and bakers who can shepherd you through the process of baking, from the basic pizza to the most decadent Christmas pudding. Join us on a journey through our bakery courses. Start with our two day sourdough course where we can show you how versatile this traditional, yeast-based dough can be. 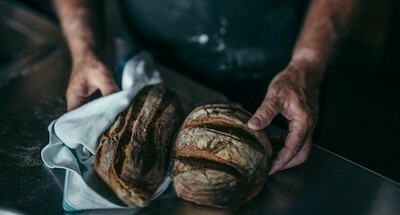 We take you through the basics of how to choose your flour and the nitty-gritty of the chemistry involved in creating and maintaining your starter before guiding you through the baking of delicious and fresh sourdough bread. Next on the menu is a course focusing on the pleasures and challenges of bread making. All the basics of the process are taught: kneading techniques, ingredients and recipes. We give you a whistle-stop tour through the variety of international breads including focaccia, wood-fired pizza and roti. For a more practical approach to bread making, our Build and Bake course will walk you through the stages in constructing your own clay oven from scratch, a traditional approach that means you can get back to basics. If you want something a little more specialised, we also offer a sweet pastry course: the perfect introduction to the world of cakes and pâtisserie. This will be a day filled with choux pastry, crème pâtissière and tarts, at the end of which you will be left with the skills and experience to produce delicious and delicate delights. On the flipside of this explosion of sugary goodness is our Proper Pastry and Pies course. At the end of this you will be able to produce a range of comforting and filling treats that will satisfy your savoury cravings from Scotch eggs to sausage rolls via steamed puddings and pork pies. We’ll cover many varieties of pastry including shortcrust and hot water crust so you can impress and feed your friends and family when you get home. You can also choose more specialist courses such as our Gluten Free and Advanced Gluten Free Cookery days. Led by nutritionist and gluten-free expert Naomi Devlin, these days will give you all the tools you need to create sweet and savoury recipes that use gluten-free flours and offer healthy alternatives for food intolerances. Finally, it’s never too soon to start thinking about Christmas: a season that is at the epicentre of the art of baking. Over two courses, we will show you how to produce festive artisan breads from around the world including Christmas brioche, Boxing Day focaccia and a sage, onion and chestnut loaf as well as grissini and Lebkuchen. Meanwhile, our Stir-up Weekend day is a decorative festival of yuletide traditions where you’ll learn how to make the perfect Christmas puddings, boozy truffles, stollen and rich homemade mincemeat. Baking isn’t just about cooking food to eat, it’s a process laden with history and tradition. Through baking you can travel the world without leaving the kitchen. Our courses will take you on a journey to other countries and cultures and will lead you through the seasons, leaving you with an understanding of what goes into the humble loaf, and the experience you will need to produce both sweet and savoury treats.